The Pyrometer Digital 250 Series Model-Kiln digital thermometer is a low cost, high temperature measurement system for use in a wide range of kiln and furnace applications. Single Fixed applications: The Digital 250 Series Model-Kiln digital thermometer can be used with a fixed in place foundry thermocouple for continuous temperature monitoring. 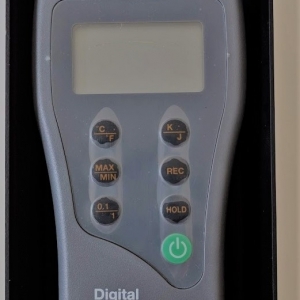 Multiple Fixed Application: The Digital 250 Series Model-Kiln digital thermometer meter accepts mini flat pin thermocouple connections that are attached to Pyro’s Fixed foundry thermocouple. 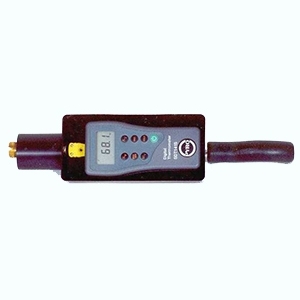 The meter can be easily disconnected and reconnected to thermocouples in other locations thus enabling multiple temperature measurements. The hand held meter case is made from durable plastic, which is enclosed by a shock resistant rubber boot with a flip out rear bracket from stand up viewing. The thermocouple-input jack is a standard mini flat pin connector for easy thermocouple interchangeability. The Digital 250 Series Model-Kiln accepts K type thermocouple inputs from Pyro’s Foundry Style thermocouples. It can also accept type J thermocouple inputs. Instrument accuracy is +/- 0.3% reading. Pyro offers a variety of K style thermocouples to meet most process measurement applications. The PYRO Digital 250-Kiln thermocouple thermometer can accommodate a wide variety of K type thermocouple tips that are suited for many types industrial and commercial temperature measurement applications.